We do not recommend Infrared (IR) pyrometers for use on tires. The outer surface of the tire cools too quickly and a probe type gets the core temperature, therefore is more accurate. IR non contact pyrometers are best for reading brake temperatures, exhaust temps, etc. 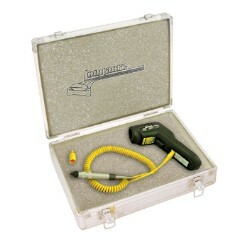 For the best of both worlds, we recommend the Longacre 50620 Dual function pyrometer. Visit our information pages for complete instructions.